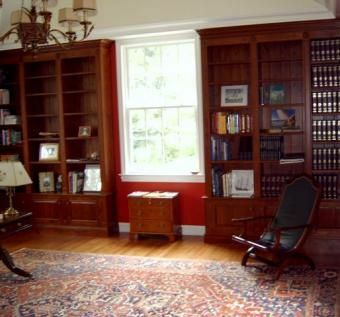 This library is made out of Alder wood that was matched to existing cabinetry in another room. It has flat fluted columns with decorative medallions at the top. The doors are raised panels, there are adjustable shelves, beaded back boards, and 5" crown moldings. Dimensions: Will build to fit the space.